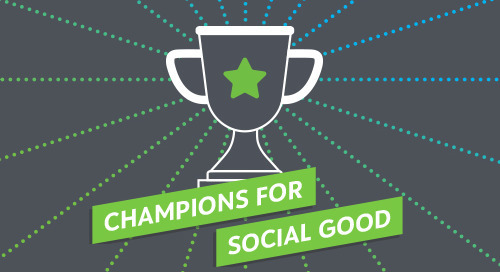 In this episode of the Champions for Social Good podcast, Rachel Hutchisson (@RachelHutchssn) speaks with Catherine LaCour, (@CatLaCour) chief marketing officer at Blackbaud (@blackbaud), about how organizations can strengthen the social economy to build a better world. The conversation kicks off with an explanation of what the social economy is, and how greater participation and greater effectiveness are the hallmarks of a strong social economy. Rachel and Catherine talk about how social good organizations can leverage the power of data, individual impact and radical collaboration to strengthen the social economy, and gives examples of how each of these three steps are being done well. Catherine also details the role that the U.N. Sustainable Development Goals play in the social economy and how they are providing an outcomes-based roadmap to all organizations. Sign up to join the conversation about how private, public and social sector organizations can work together to strengthen the social economy at http://hi.blackbaud.com/social-economy/.